A huge crowd gathered in the Penn &amp; Teller Theater at the Rio yesterday for the first day of the World Series of Poker Main Event final table. After nearly a four-month break, the "November Nine" returned to Las Vegas for their final shots at the WSOP Main Event bracelet. All the players came to the table guaranteed $900,670 (which had been paid back in July, but they all had their eyes on the top prize of $9.1 million. Dennis Phillips came into the day the chip leader, with Ivan Demidov close behind. Kelly Kim started the final table in survival mode, with less than 10% of Phillips' stack. At the end of the day, it was a truly World Series of Poker final table, as the last two standing were Denmark's Peter Eastgate and Russia's Ivan Demidov, who will battle heads-up tonight for the bracelet and the most prestigious title in poker. Since making the final table back in the summer, many of the nine finalists have traveled to WSOP Europe and various other tournaments around the world honing their skills, but none made good like Ivan Demidov, who logged a second WSOP Main Event final table before he ever sat down at this one. Demidov finished third in the WSOP Europe Main Event, and returned to Las Vegas looking to improve on that finish. Chip leader Phillips came into the final table with a narrow lead over the young Russian Ivan Demidov, but he ran into trouble early at the final table. His stack took a hit early in a confrontation with Ylon Schwartz, and then he ran into a big hand with Ivan Demidov just a few hands later. Phillips limped in from under the gun, and Demidov raised in late position. Phillips quickly three-bet, and Demidov went into the tank for a long moment before finally making another big raise, putting the pressure right back on Phillips. Phillips called, and when all was said and done it cost each man over a third of his chips to get to the flop. Phillips went into the tank on the flop before leading out with a small bet of about one-fourth the pot. Demidov quickly moved all in over the top, and the former chip leader Phillips had to think about whether or not to call for his tournament life, as Demidov had him slightly covered. After a long time in the tank, Phillips folded as Demidov cemented his chip lead in dramatic fashion. Phillips tumbled to almost the bottom of the leader board after that hand. Kelly Kim came into the final table as the shortest of the short stacks, but managed a key double-up through Ivan Demidov in hopes of moving up the pay ladder. Demidov raised enough preflop to put Kim all in, and Kim snap-called with . Demidov was dominated with his , but picked up an inside straight draw on the turn with the board reading . The river was the harmless , and Kim doubled through the chip leader to stay alive. Dennis Phillips was next to double up when he moved all in with over the top of David "Chino" Rheem's preflop raise. Rheem though for a moment before calling with and finding himself dominated. The board ran out a pedestrian , and Phillips doubled up to move off life support. In all, it took over 50 hands for the first elimination to occur. Craig Marquis was the first to bust off the final table when he moved all in preflop with and found one caller in Scott Montgomery with . They went heads-up to the flop, and the coin flip seemed to be decided immediately when the hit the flop, but it was followed by the to give Marquis a set and put him in prime position for a double up. The board read on the turn, giving Marquis outs to the Broadwa straight , and sure enough, the hit on the river to giver Montgomery the runner-runner straight and send Marquis home in ninth place ($900,670). Kelly Kim came back from the first break with an extra $300,000 and change guaranteed due to Marquis' bustout, and promptly got the last remnants of his stack into the middle preflop in a multi-way pot against Ylon Schwartz, Darus Suharto and Ivan Demidov, who had all limped in and then called the extra pittance of a raise that Kim put in from the big blind. Demidov led out into the side pot on a flop of , and Schwartz got out of the way. Suharto called, and the hit the turn. Demidov checked, and Suharto checked behind to see the come on the river. Both players checked again, and Demidov showed for one pair. Suharto took the side pot with , and Kim mucked his hand, collecting $1,288,217 for eighth place. David "Chino" Rheem lost a couple of big pots early to find himself on the short stack,, though he doubled up once himself to stay alive. When he picked up , he moved all in without hesitation. He was called by Peter Eastgate, and was in the perfect position to double up when Eastgate tabled . The flop did not cooperate, however, as the in the door gave Eastgate the lead on the board of . Rheem was left looking for a king or running Broadway cards, and the on the turn was no help at all. The river also missed, and Rheem picked up $1,772,650 for seventh place. After starting the day with the chip lead, Dennis Phillips took a couple of huge hits to his stack early to find himself among the short stacks. He then doubled through Ylon Schwartz in dramatic fashion to regain a healthy stack and some sense of momentum. Schwartz stuck out a healthy raise preflop with pocket queens, and Phillips moved all in over the top, only to find his drawing thin. However, the flop gave Phillips the lead in the hand. Schwartz was left drawing to one out on the turn, and the on the river gave Phillips a healthy stack once again. Darus Suharto became the sixth-place finisher ($2,418,562) when he moved all in over the top of Scott Montgomery's preflop raise with . Montgomery thought for a long moment before making the call, and his was ahead in dominating fashion. The flop was even better for Montgomery, who made the nut flush on the turn and left Suharto drawing dead. The river was a meaningless as one of the two Canadians playing eliminated the other from the final table. Montgomery's time among the chip leaders was short-lived, however, as he lost a huge pot to Ivan Demidov soon after busting Suharto. Montgomery raised preflop with , and Demidov three-bet from the big blind. After a minute or so in thought, Montgomery moved all in. Demidov called instantly with , and Montgomery needed help. The flop came down , giving Montgomery more outs to the nut flush. The on the turn was no help, and when the river brought the , Demidov reclaimed the chip lead and Montgomery was left crippled. Montgomery got all his chips in preflop just a few hands later with after Peter Eastgate made a preflop raise. Eastgate called with , and Montgomery promptly hit an ace on the flop. The turn brought the , and when Dennis Phillips told the table he folded a six, Eastgate was drawing to one out. That one out proved to be the , which came on the river to give Eastgate the full house and send Montgomery home in fifth place ($3,096,768). That hand put Eastgate firmly in second place in chips, close behind chip leader Ivan Demidov. Four-handed play continued for nearly two hours, with most hands being taken down by a preflop raise. Finally, Ylon Schwartz and Peter Eastgate tangled for the final time, and Schwartz got the short end of it to finish in fourth place ($3,774,974). Eastgate raised preflop with , and Schwartz called. Both players checked the flop, and the turn brought the . Schwartz checked the turn and Eastgate led out. Schwartz called again, and the river brought the . Eastgate led out again, and Schwartz moved all in over the top with . Eastgate made the easy call with his rivered full house, and Schwartz was done. At the end of the night, it was former chip leader Dennis Phillips who looked on as the two young European stars, Demidov and Eastgate, traded the chip lead back and forth for most of the late going. The final pairing was set up when Phillips busted in third place ($4,517,773) courtesy of Peter Eastgate. Eastgate raised preflop with , and Phillips called. The flop came down , and Eastgate led out with a bet the same size as his preflop raise. Phillips thought for a moment, then moved all in over the top in a bold bluff with . Eastgate called instantly with his flopped set, and Phillips needed to draw perfect to stay alive. The on the turn ended all suspense, as Phillips was drawing dead. The river ended the action for the night, and Phillips headed to the rail to a rousing ovation from his 300-plus supporters. Heads-up play will commence at 10PM local time, as Peter Eastgate tries to break Phil Hellmuth's record for youngest Main Event champion ever. 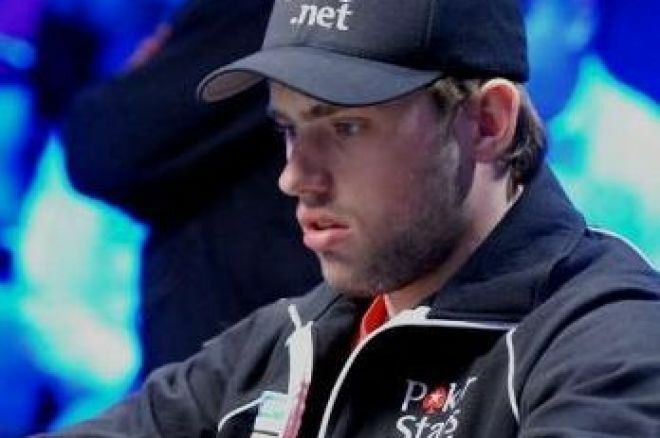 Ivan Demidov has already earned a place in the record books for being the first player to make the final tables of the WSOP Europe and the WSOP America. He has bettered his finish in London by at least one spot. Join PokerNews at 10PM Las Vegas time for all the live updates from the endgame of the final table.